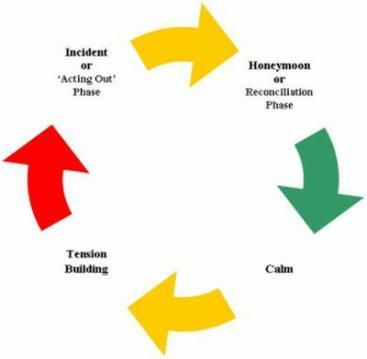 The domestic violence cycle of abuse diagramm helps us to understand the different phases which typically occur in abusive relationships before, during and after an abusive episode. Most abusive relationships display a distinct pattern, known as the Cycle of Abuse or Violence. Abuse is rarely constant but alternates between: tension building, acting out, the honeymoon period and calm. Not all relationships follow the same cycle, and individual experiences vary, some stages - especially the honeymoon or calm periods, may shorten or be left out completely, especially as the abuse intensifies over a period of time. Or other forms of abuse as found in the power and control wheel. This information is provided courtesy of Kim Eyer of rhiannon3.org .